We have just installed Meebo Bar in our site which is positioned across the bottom of every pages. With the help of Meebo Bar, now our visitor can connect with their friends on any communication and social networking. 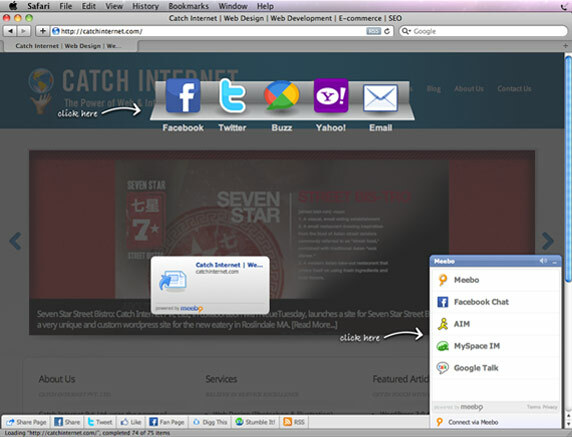 There is connect via Meebo bar at the bottom right, from where our visitor can connect and chat with friends on Facebook, AIM, Google Talk, MySpace and Meebo. In the same way they can share articles in social networks by clicking on Share Page at the bottom left. Since meebo room was closed on October 4 2011, you may use RumbleTalk chat for websites.